For making the rice: Whisk together vinegar, sugar and salt; set aside while cooking the rice. Combine rice with 4 cups of water in a large saucepan; bring to a boil. Once boiling, cover the pot and cook over a low flame for 20 minutes. Turn off the heat and let sit for an additional 20 minutes. Spread rice into a 9×11 pan, and pour in the seasoned vinegar; stir to combine, cover, and allow to sit for at least 20 minutes (can be made 8 hours ahead of time, covered and chilled – bring to room temperature before rolling). For rolling: place a single nori sheet onto the bamboo mat. Spread a thin layer of sushi rice halfway up the seaweed with a spoon, dipping the spoon into a small bowl of water if needed. 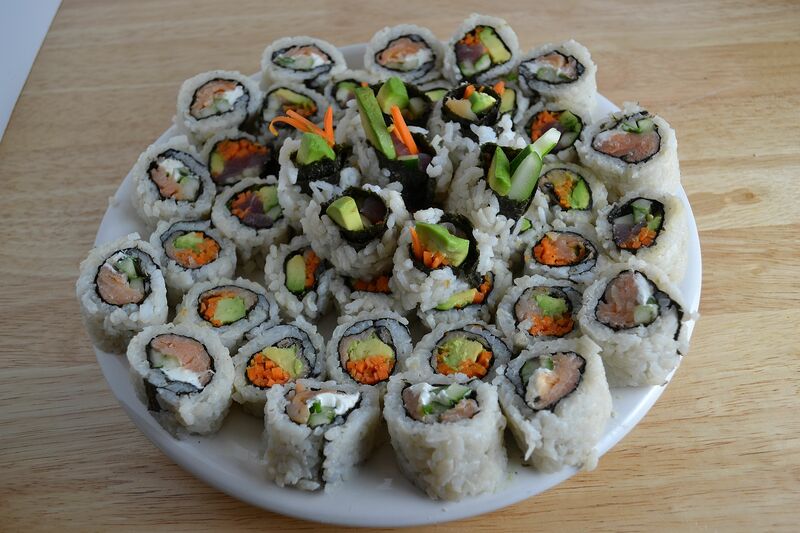 Gently turn the seaweed sheet over, and arrange desired fillings onto the half with no rice on the other side. Slowly roll the seaweed sheet towards the top of the bamboo mat around the filling, using the mat to tighten the roll. This will make rolls with rice on the outside (for rolls with seaweed on the outside, don’t turn over the seaweed after spreading on the rice). For serving: use a serrated knife to cut the rolls into slices 1 to 1 1/2 inches thick – dip knife into a glass of water if needed. Serve with dipping sauces and chopsticks, and enjoy!